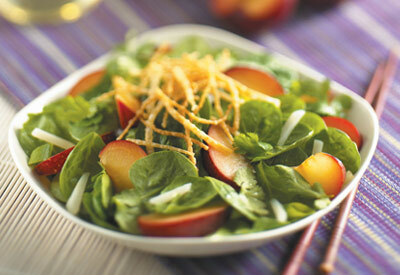 Combine all salad ingredients in a medium salad bowl. Whisk together all dressing ingredients and pour over salad. Toss well to coat and top with won ton strips. Cut won ton wrappers into 1/4- inch strips. Fry in 1- inch of hot vegetable oil for 2 minutes or until golden brown then remove with a slotted spoon and drain well on paper towels.